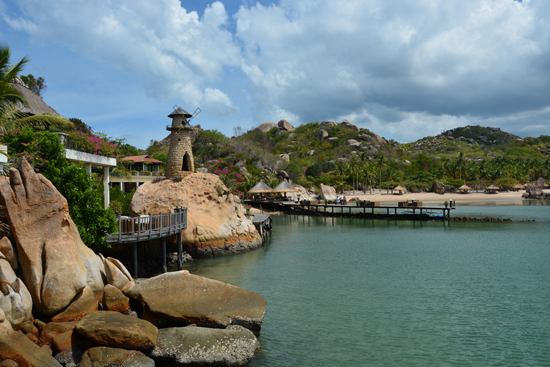 Ngoc Suong Yen Bay has a gorgeous secluded setting on Cam Ranh Bay but this resort completely flies under the radar, with no information available in English online. Ngoc Suong is a well-known nationwide restaurant and the company owns this 10-year old property. This explains the confusion of why all the locals kept trying to direct us to the restaurant. 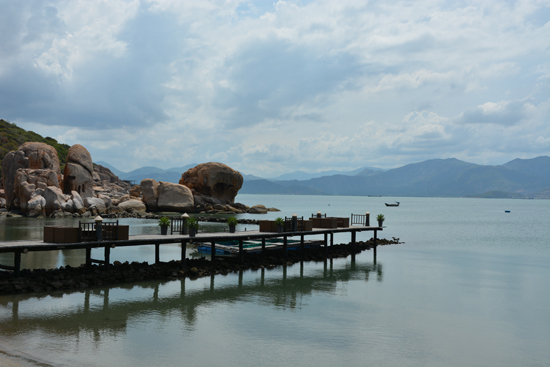 The mainland almost fully encircles Cam Ranh Bay like a C and the resort is located on the southern tip, where the two points stretch to almost touch. The cove-like beach is small and sheltered so that the water is flat and calm. Palms dreamily line the sand while natural boulders throughout the property add drama. 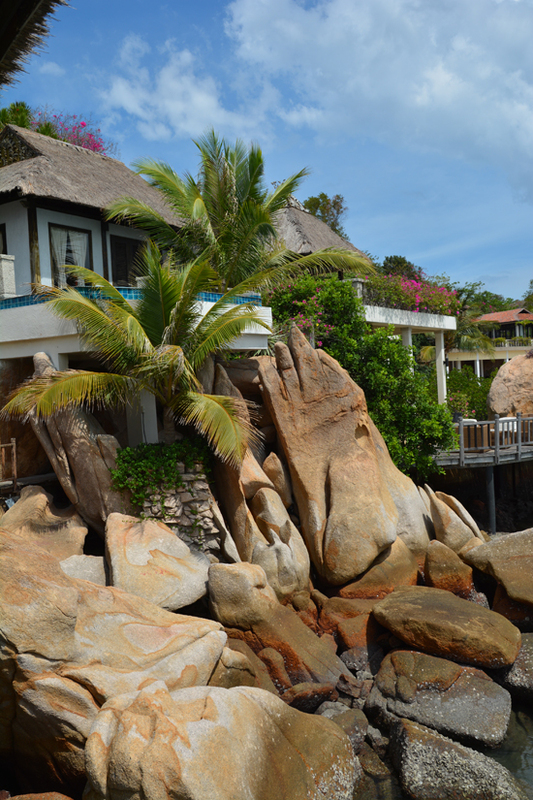 They’ve been incorporated into the landscape and the resort, with some boulders integrated into the actual buildings. A jetty leading out on the water has tables and chairs for lovely dining on the water. The windmill perched on a boulder is an unnecessary decorative feature and mars an otherwise pretty landscape, but keep in mind that Ngoc Suong Yen Bay caters to Vietnamese tourists. At least the windmill is made of stone and there are no bright concrete animal statues — which seems to be a common decoration in Nha Trang. Everything else has been left quite natural, tropical and wild. View of the resort from the bungalows. Windmill included. The well-spoken receptionist acknowledged they had plans to target foreign tourists but they were working on improving service and adding amenities as the resort was not yet up to Western standards. She also recommended not staying more than one or two days during rainy season (October to January) as it could be very boring during downpours. Calm waters = happy stay. 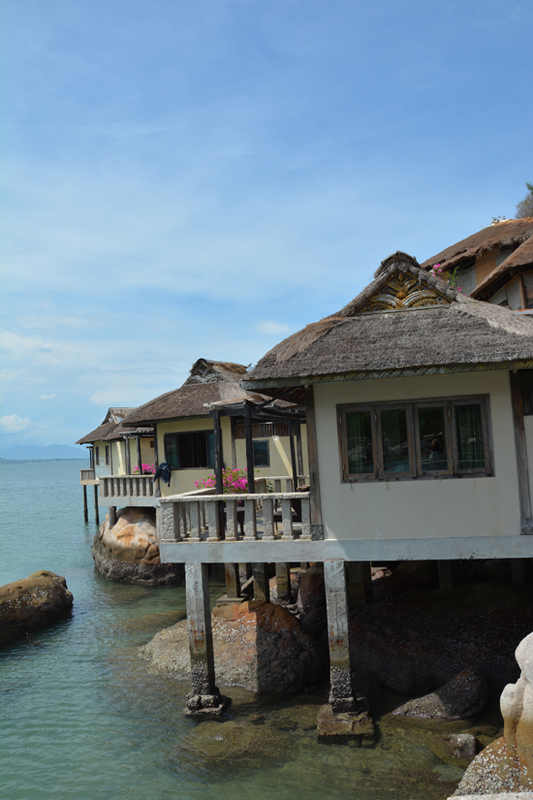 Wooden boardwalks lead to solid bungalows built on top of the water. The raised thatch roof allows for the sea breeze to come in and cool everything down as there is no air-con except in one villa. While the rooms wouldn’t win any style awards, the interiors are fairly tasteful with wood furniture, neutral colours and natural materials, plus each comes with a small plunge pool with an ocean view. Bathrooms are enormous marble, tile and stone affairs, and in one bungalow we saw, there was an outdoor bathroom, the stone hillside forming part of the wall. If you’re travelling on motorbike and budget is not an issue, this would be a fantastic place to base yourself for exploration of the wild, empty beaches south along the coast. 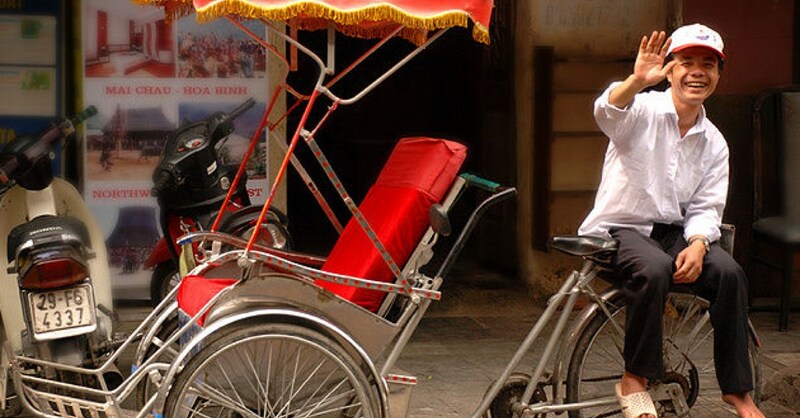 It is pricey and you won’t get a Western level of service, fine dining or a lively atmosphere. But chances are you will have it almost to yourself as the property only has nine rooms. 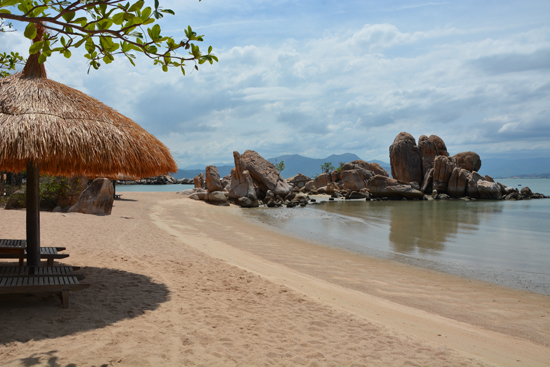 Another option is to come here for the day, with admission to resort and beach only 50,000 VND per person. 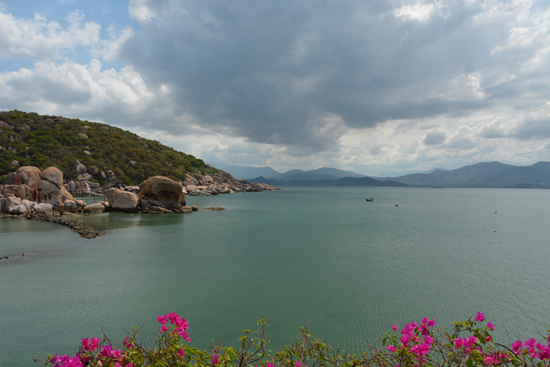 View of Cam Ranh Bay from the bungalow. To get here by road, travel south on National Route 1 from Cam Ranh City and turn off left at 11.814655, 109.108326 (this is the same road you take to get to Bien Tien beach). After a kilometre, at the T-junction go left and continue for another 4.3 km. There will be a hill and a sign for the resort pointing to a steep side road to the left. Follow that road and the signs. From Highway 1 it is 13 km total to reach the resort. For four people, fan-cooled. Air-con: 3,600,000. Room: Bungalow fan private bathroom, low season: 2,000,000 dong, high season 2,000,000 dong. Notes: With bathtub 2,000,000. Room: Private pool villa, low season: 3,200,000 dong, high season 3,200,000 dong. Notes: For four people, fan-cooled. Air-con: 3,600,000.